but engage fully in all meritorious actions. in all their virtuous deeds, i rejoice. 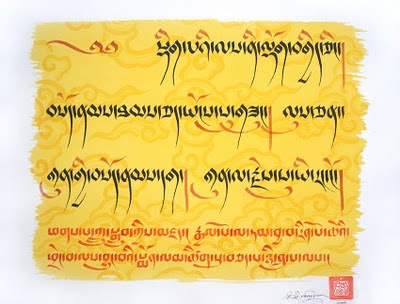 The smaller Petsug script is in reference to the composer of this wishing prayer, named Phag pa Lundrub. This calligraphy piece was especially commissioned by The Moscow Contemporary museum of calligraphy, july 2009. In July 2009 the Contemporary museum of calligraphy in Moscow invited Tashi to join their body of participants of world class calligraphers. The 80 project participants have all contributed calligraphy master-pieces to the museums permanent and touring exhibitions. 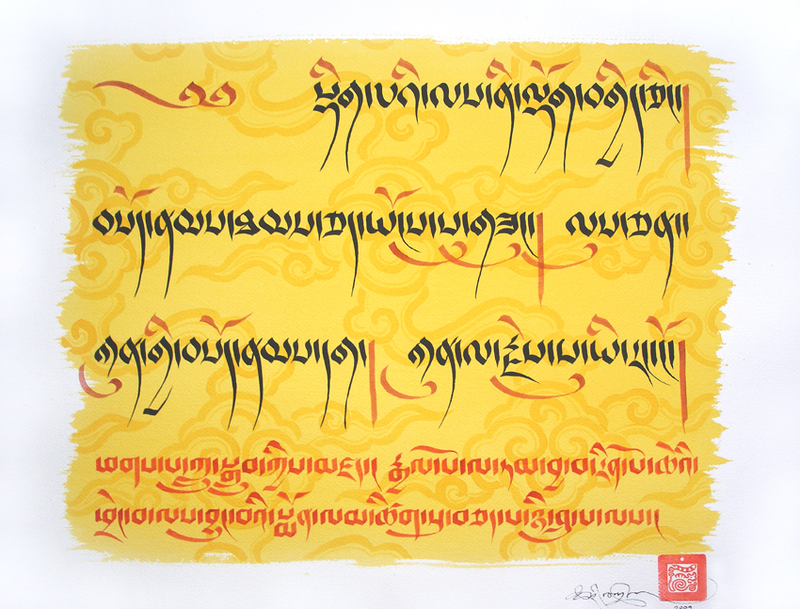 Tashi is the only contributing artist in Tibetan calligraphy and the only participant representing Great Britain. In 2009 Moscow became the capital of calligraphy, boasting the largest exhibition of calligraphy in the world. It is where the Orient meets the West, professional artists speak to amateurs, classical calligraphy joins ultramodern art pieces. The exposition will feature art works from 33 countries: refined Slavonic and European calligraphy, traditionally reserved Japanese and Chinese creations, elegant scripts of the Hebrew and Arabic calligraphy schools. The metropolitan audience has a rare chance to see valuable handwritten books, calligraphy masterpieces included in the Guinness World Records. Visitors may participate in mink-festivals of the Japanese, Tibetan and Slavonic cultures and visit calligraphy master-classes. The exhibition is organized under the aegis of the Commission of the Russian Federation for UNESCO and supported by the Ministry for cultural affairs of the Russian Federation. Also the exhibition was officially recognized by the Russian Orthodox Church, the Russian rabbinate, Russian Council of Muftis and Buddhist organizations. This all emphasizes the special significance of the coming event for the cultural heritage. From October 14th 2009 walls of the unique 4,000 sq.m. 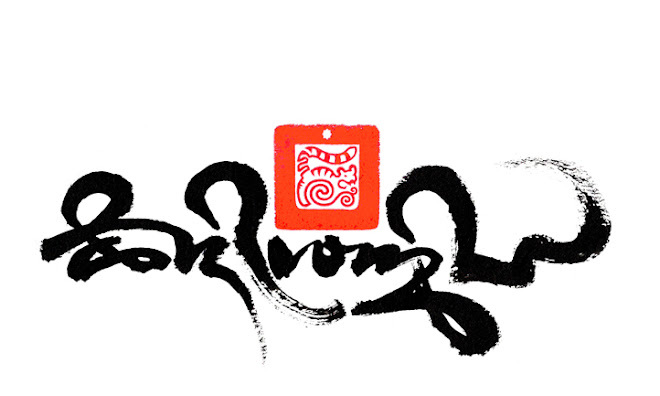 “Victory” pavilion will host art pieces of 100 calligraphers from 33 countries. Near 200 calligraphy master-pieces will be demonstrated for the first time. click here for details on the 2009 exhibition. 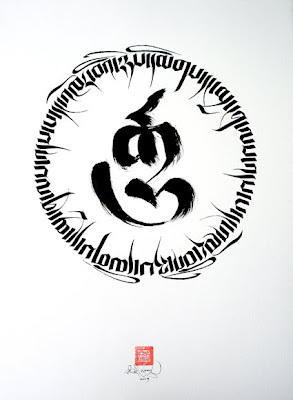 Also, on lone to the calligraphy museum, is a selection of Tashi's other calligraphic works, these include a piece each from his Contemporary Tibetan, Black on Black and Illuminated iconographic series. These will be shown until 2014, on a touring exhibition that will be held in the words leading cities, starting with Paris. More details of Tashi's contribution of pieces to the museum can be seen here. One of the pieces on lone to the Moscow contemporary museum of calligraphy. 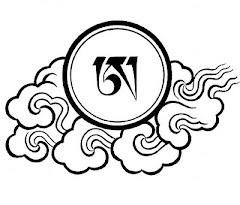 Another blog worthy of a visit, which could be said to be the most bang-on and informative Buddhist blog ever created. Please take some time to visit the "Digital Tibetan Buddhist Alter" who recently sang the praises of Tashi.